Not long ago we heard a rumor that Huawei was working on a new wearable dubbed the Huawei Watch GT Active, and now the company has accidentally confirmed as much, having posted an image of the watch (labeled ‘Huawei Watch GT Active Edition’) on its website. That image has since been removed, but not before Wareable saved it, so you can see the picture below. Other than confirming the name and existence of the watch there’s not really anything new to see here, as the original rumor also included an image which this matches up with. The design looks broadly similar to the standard Huawei Watch GT, but with some different colors. What this inadvertent confirmation from Huawei also does is suggest it’s very likely that the Huawei Watch GT Active will be announced on March 26, as the company is holding an event to launch the Huawei P30 range on that date. We might also see the Huawei Watch GT Elegant there, as this has also previously been rumored. 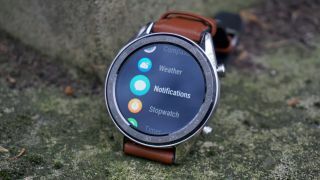 We don’t know much about these wearables yet, but based on earlier leaks they’re likely to retain the same 1.39-inch OLED screen and Lite OS as the standard Huawei Watch GT. However, they could be more expensive, with the Active rumored to be €249 (around $280 / £215 / AU$395) and the Elegant said to be €229 (roughly $255 / £200 / AU$365), while the standard Huawei Watch GT starts at $199 / £199 (around AU$230). What you’ll get for your extra money remains to be seen. With the word ‘Active’ in its name there’s likely to be a focus on health and fitness tracking with that model, but the standard Watch GT already has a heart rate monitor, GPS and waterproofing. Still, we should find out before long.